Combine milk, cornmeal, and salt in saucepan; heat to boiling, stirring constantly. Reduce heat; cook 5 minutes. Add maple syrup and butter. Cool to lukewarm. Sprinkle yeast over warm water. Add softened yeast to cooled cornmeal mixture. Add two cups of the flour; beat thoroughly. Add enough remaining flour to make a stiff dough. Knead ‘til smooth and elastic. Place in a well-greased bowl, turn once and cover. Let rise until doubled. Divide in half. 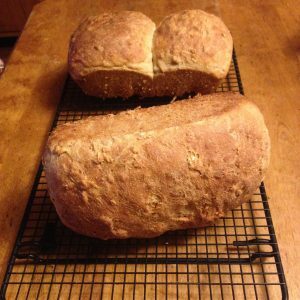 Shape into two loaves, and place into greased bread pans. May also be formed into rolls. Cover and let rise until doubled, about 40 minutes. Bake at 375 degrees, about 50 minutes. Turn out and serve with butter, and for a real treat, Maple Cream!